FEATURESCmpact size for practice and small jamsCarbon fiber look and feelCritically acclaimed Marsha.. The Dhruva Nano Zx is a harmonium-type drone sruti box (sur-peti) that is also a Tuner / S.. The Radel Milan is the first of its kind unique 2-in-1 Digital Tabla-Tanpura.The Milan is .. The Saarang Maestro Dx is the best-selling twin digital tambura (tanpura), with superb nat.. The new Saarang Micro V6 digital tambura (tanpura) is the ideal choice as an entry-level t..
Violin will keep you going for that symphony over and over again. 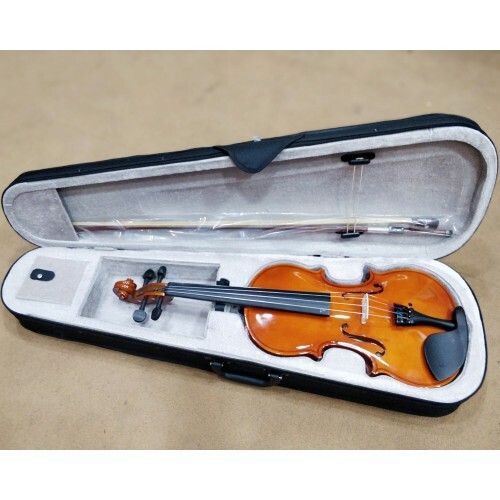 Its brilliant make of Spruce..
Violin will keep you going for that symphony over and over again.Its brilliant make of Spruce wood t..
Deluxe violin case comfortably fits and protects two full-size violins.Super high quality fiberglass..